In summer 2010 the historian Barbara Rappenglück and other scientists of the Chiemgau Impact Research Team have published an article in the prestigious international journal “Antiquity”. The article having been peer-reviewed by independent international experts is entitled “The fall of Phaethon: a Greco-Roman geomyth preserves the memory of a meteorite impact in Bavaria (south-east Germany)“ (Antiquity 84, 2010, 428-439; http://antiquity.ac.uk/ant/084/ant0840428.htm). In the actual issue of “Antiquity” officials of the Bavarian State Office for Environment (LfU) give a (not peer-reviewed) “Response” to the article of Rappenglück et al., trying to basically question the existence of a meteorite impact in the Chiemgau area (Bavaria, Germany), the so-called Chiemgau impact (Doppler et al., Antiquity 85, 2011, 274-277). Rappenglück et al. reply in the same issue of „Antiquity“ and reject the objections of the LfU (Antiquity 85, 2011, 278-280; http://antiquity.ac.uk/ant/085/ant0850278.htm). The copyright guidelines of “Antiquity” do not allow for making the text available on this website. Hence we here give an overview of our rejection. Doppler et al.’s argumentation relies on studies that are based on approaches inappropriate for impact research. This is illustrated by the following example: Doppler et al. (2011: 276) reject our proposed 900×400 m double-crater (Ernstson et al. 2010: 21; Rappenglück et al. 2010: 430) in Lake Chiemsee with the argument that “over 200 km of seismic profiles” and four piston cores had not shown any “major disturbance in the sedimentary sequence”. Let us first look at the “200 km of seismic profiles”. This seemingly remarkable length, being projected on the expanse of Lake Chiemsee with its 80 km2 as an orthogonal net, turns out to produce a big mesh size of about 800 m. This means that even a big structure like the double-crater could easily have escaped detection. In comparison, our detection of the double-crater happened by spider-web-like sonar measurements of a small section of the lake. Let us additionally look on Doppler et al.’s four piston cores. With respect to impact research four cores in relation to an expanse of 80 km2 are comparable to a needle in a haystack. Additionally, Doppler et al. are taken in by the misapprehension that in case of secondary impacts into Lake Chiemsee its total lakebed would have been completely disturbed (Doppler et al. 2011: 276: “They [the cores] produced undisturbed sections and show no indication of a major disturbance in the sedimentary sequence which would be expected from an impact.”) This idea shows an amateur-like understanding of impact processes and a total ignorance of the geophysics involved in a meteorite impact, as will be shown in the next paragraph dealing with their drilling at Lake Tüttensee. The central argument of Doppler et al. is based on a drilling at the edge of Lake Tüttensee, where they encountered “an undisturbed sequence ranging from 4800 years ago near the surface to 12 500 years ago from the lake deposits at the base” (Doppler et al. 2011: 274). From this observation they conclude that neither the Tüttensee basin is a meteorite crater nor has it been formed in very recent Holocene times (as claimed by us), but owes its existence to the last ice age. Doppler et al.’s conclusion is based on the (false) assumption that the location of their drilling is inside the crater. The question whether the location is inside or outside the crater is essential with respect to the intensity of the impact forces, their propagation and their effects. The nowadays visible rests of the rim wall suggests that the location of the drilling should be inside the original crater. But as it is illustrated in the graphics, this is not true. The location of the drilling is outside the original cavity of the crater, where according to impact cratering shock intensities are already lowered to such a degree (a few kbars maximum pressure) that minor deformations are not possibly to be seen in a few-centimeter diameter sized drill core, not to mention the absence of any detectable enhanced temperature signature. Hence, Doppler et al.’s central argument proofs to be invalid. 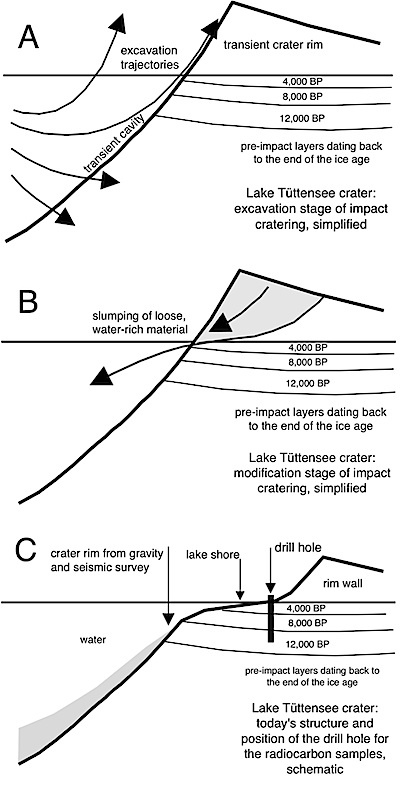 Simplified impact cratering process and the position of the LfU drill hole. First published in ‘Antiquity’ 85, 2011, 279. Here we point out our decisive argument for a meteorite impact, which has been consequently ignored by Doppler et al. Planar deformation features (PDFs) in quartz, a manifestation of shock metamorphism of rocks, is internationally accepted as proof of an impact (Stöffler & Langenhorst 1994: 165). PDFs are the result of very short-term but extreme forces (minimum pressures for the formation of PDFs in quartz are about 5-10 GPa [50-100 kbar]) and can only be caused by the impact of a meteorite. Neither tectonic processes nor the pressure of rock or ice overburden produce effects attributed to shock metamorphism. We have found PDFs in rocks from the Tüttensee ring wall and in the surrounding ejecta layer (as well as in other parts of our crater strewn field) (Ernstson et al. 2010: 82). These rocks were shocked in the very beginning of the impact in the center of the expanding cavity, excavated from the crater and deposited outside of it. A photomicrograph of such PDFs was published in our article (Rappenglück et al. 2010: fig. 3); PDFs from several locations in our crater field can be seen in Ernstson et al. (2010: 82). For that reason alone the Chiemgau meteorite impact is confirmed. Instead of facing up this evidence of shock metamorphism and respecting the internationally accepted cogency of shock metamorphism for the proof of a meteorite impact, Doppler et al. try to persuade their readers that their (untenable) criticism of secondary aspects (be it the question of the dating, of the carbonaceous spherules, the strongly corroded cobbles, the vitrified stones, the so-called groove stones, the iron silicides etc.) brings discredit on the impact event as a whole. With this tactics our critics for one thing apply an unscientific practice, for another thing they thereby give proof of their fundamental lack of knowledge concerning impact research and the accepted criterions in this field of research. Doppler et al. by themselves provide an almost absurd evidence of this ignorance by mentioning „astronomical conditions required as a criteria for an impact“ (Doppler et al. 2011: 277, with reference to Heinlein). Such “astronomical conditions required as criteria for an impact” simply do not exist. The reference to Heinlein (Der so genannte „Kelten-Killer-Komet“ – Gab es einen Kometeneinschlag im Chiemgau? Journal für Astronomie, III/2009, Nr. 30, Zeitschrift der Vereinigung der Sternfreunde e.V., p. 84-86.) shows that a confusion of „criteria“ and „model calculations“ is obviously given. Model calculations are characterized by a number of variables that have to be adapted in accordance to the progress of science. Hence they cannot serve as criteria for the proof of anything, and our critics are taken in by a misapprehension. At http://www.chiemgau-impact.com/neu_disk.html more detailed information concerning the internationally accepted criteria for meteorite impacts are available as well as an overview how the Chiemgau impact matches these criteria. Here we present some examples of Doppler et al.’s false handling of our text in “Antiquity” (Rappenglück et al. 2010: 428-439) that show that Doppler et al.’s text even lacks the fundamental formal demands of a scientific debate. Doppler et al. (2011: 274) contend that we would date the Chiemgau impact to “some 2500 years ago” in “the Iron Age”. In actual fact we have dated the event to a period of 4200-2800 years ago (2200-800 BC), this means the Bronze Age (Rappenglück et al. 2010: 436). Doppler et al. (2011: 274) contend that we would date the impact by the myth. This is false: We have dated the impact and the myth independently from each other and then compared the dates (Rappenglück et al. 2010: 435-37). Doppler et al. contend (2011: 276) that we would claim that once the Lake Chiemsee included the Lake Tüttensee. This is simply not true, and of course they fail to mention the passage in our “Antiquity” article, where this assertion should allegedly be made. This kind of handling our text can at least be called slipshod, if it is not willful distortion. Remarkably, this kind of handling texts continues even with studies that they use to underpin their statements: Doppler et al. (2011: 277) contend that Möslein identified the disputed deposit at Stöttham “as anthropogenic”. Of course they do not give a reference, because in his excavation report (Möslein, S., 2009. Grabungsbericht. Chieming TS, Stöttham-Dorfäcker 2007/08. Technical report, Bad-Tölz, unpubl. ; available at the administrative district office of Traunstein) Möslein does not at all classify the process of deposition of the layer in question (Möslein 2009: 14f.). Doppler et al. (2011: 276) also cite Gareis (Gareis, J. 1978. Die Toteisfluren des bayerischen Alpenvorlandes als Zeugnis für die Art des spätwürmzeitlichen Eisschwundes [Würzburger Geographische Arbeiten 46]. Würzburg) as a key witness for the glacial formation of the Tüttensee landscape. But Gareis (1978: 68) several times explicitly excludes a glacial origin of parts of the Tüttensee rim wall. These examples cast a poor light even on the formal solidity of Doppler et al.’s text. Liritzis, I., N. Zacharias, G.S. Polymeris, G. Kitis, K. Ernstson, D. Sudhaus, A. Neumair, W. Mayer, M.A. Rappenglück, B. Rappenglück (2010), The Chiemgau Meteorite Impact and Tsunami Event (Southeast Germany): First OSL Dating: Mediterranean Archaeology & Archaeometry, Vol.10, No. 4 (in press). Schüssler, U., M. Rappenglück, K. Ernstson, W. Mayer, B. Rappenglück (2005), Das Impakt-Kraterstreufeld im Chiemgau: European Journal of Mineralogy 17, Bh. 1, 124.